What Has Happened To Swansea? This in itself isn’t a problem, being lucky is fine if you are aware of it and can make actionable improvements. And, at the beginning of the season, this seemed the case. Public rumblings from Monk gave the impression that he was aware of the difficulty in repeating the feats of the year before, a conclusion that was easy to arrive at even without analytics: last year, Swansea poached 12 points from doubles over Arsenal and Manchester United; had they gotten 3 points instead, they would have finished in the bottom half. The season started brightly, solidifying my optimism in Monk registering that there were defects within the team and doing something about it. At Chelsea on the opening day of the season, I watched Swansea register 10 shots on target as they drew 2-2. Ten. Newcastle were swiftly despatched to follow, with their rivals Sunderland luckily earning a draw in the next match. In all of these games, Swansea had higher expected goals than their opponent, and had legitimately looked good in repeatable footballing terms. (For anyone new to ‘expected goals’, they are a method of quantifying chance quality based on historical trends, mainly the location of a shot, and correlate better with goals than mere shot numbers.) Next, they beat Manchester United at home, albeit luckily. At the beginning of September, you could forgive even the most sceptical fan for believing that another good season may be on the horizon. Yet here we are, in March, and everything is a mess – had you been on holiday from September until now, it would look like the footballing equivalent of The Hangover, except instead of a live tiger, there is a dead panther. Monk has been sacked, Swansea have been yoyo-ing in and out of the genuine relegation race, Alan Curtis has been appointed, un-appointed in place of Francesco Guidolin, and then reappointed as caretaker while the Italian was ill. A guilty whiff of schadenfreude has emanated from the Liberty Stadium all season, sucked up by bitter competition, the analytics community, and the same media that mere months ago were lauding the club as a role model and Monk as England’s next big thing. At the beginning of September, Swansea had managed higher expected goals than their opponents in 3 games. Until their game against Aston Villa in mid-October, they didn’t manage this in a match again. It wasn’t until they had marginally more chances than West Ham in late December that they took their tally of games where they had the greater chances to 6; by this point, they had played 17 games, were in the relegation zone, and Monk was gone. In November, Monk had attempted to halt the slump in form by changing his team selection, dropping Federico Fernandez, Gylfi Sigurdsson, and Bafetimbi Gomis for Kyle Bartley, Leon Britton and Eder against Bournemouth. At this point, it was obvious that the manager was concerned in his team, and that these line-up decisions were an attempt to change things. These changes didn’t, in the end, have a marked effect on performances in terms of chance creation, but preceded a huge divergence in goal difference from expected goal difference, at the worst point of which Monk was sacked. It may be that Monk had affected team finishing to a point where he drove this under-performance, but it is unlikely – as we saw from Swansea last year, most of the time divergence from expected goals can be explained in terms of unrepeatable streaks in finishing or saving. It is in this period of under-performance, from Monk being sacked to just after Guidolin was appointed, that the narrative of Swansea’s season took a drastic turn for the worse, from “they’re too good to go down, they’ll be fine” to “oh sh*t”. Where Monk was lucky last year and had seemingly built the foundations of a long-term career on the hype he gained, a short-term inversion in the same dynamics had lost him his job. This ‘unlucky’ slump continued after Monk’s exit (strengthening the idea that he wasn’t to blame for it), with Curtis’ team improving performances but not picking up the points that they deserved. This lead to the panicked appointment of Francesco Guidolin, after which Swansea’s luck completely changed: fortuitous wins against Watford and Everton kick-started a miraculous run since the turn of the year, and one that has saved Swansea from the threat of relegation. Swansea City have more points in 2016 (17) than either Arsenal, Liverpool or Manchester City. #Swans 8th best in PL this year. Swansea have been lucky in the sense that they have had few injuries, though with the tinkering of the team the consistency of a starting XI like Leicester have was lost anyway. For the whole season, Swansea had under-performed their expected goal difference, and it had caused them serious issues, yet eventually they were saved by a reversal of these fortunes. This is no small irony, especially in the greater context. I do feel sorry for Garry Monk. The commitment that the club made to him was seemingly one of longevity, and yet they got rid of him at the first sign of downturn. Despite riding his luck last season, the team genuinely improved at the beginning of this one, though the why is ever confusing and it was short-lived; bar that brief stint, the team hadn’t improved at all. Because of this, as a fan of Swansea City, I’m not hugely disappointed he’s gone. Overall, the club have played markedly better than last year, but are still consistently performing like a lower-midtable club. 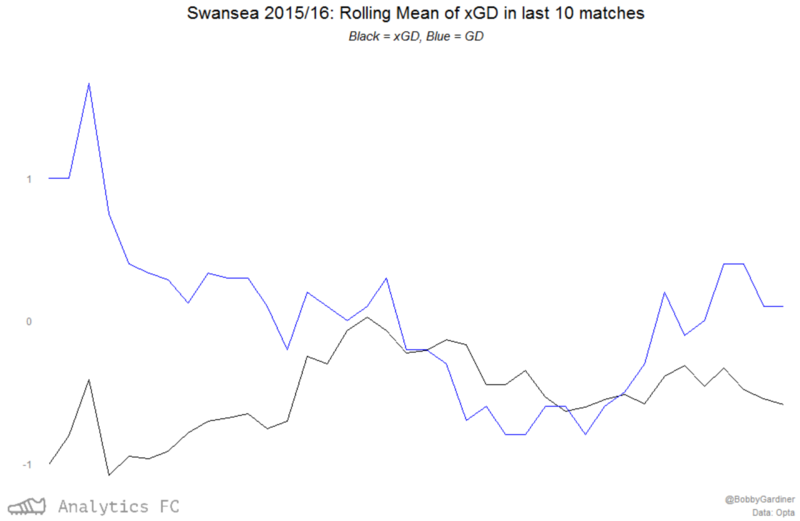 The standard deviation in Swansea’s single-match xGDs is fairly low – only 6 teams have less variation in their performances – and this is despite the beginning of the season. Recently, Ben Torvaney has advocated the conceptualisation of a team’s expected goal difference in matches as a distribution, and ranking by median. This helps show what type of performances a team is tending to throw up. Swansea’s median performance is the 5th worst in the league. Overall, Swansea’s aggregated expected goal difference is also the 5th worst in the league. Their defence is fairly average at 12th in the league, but their attack is diabolical – only Aston Villa are worse. This passes my eye test with flying colours. Watching Swansea attack at the moment is incredibly frustrating, but the defending looks better than last year and has done all season. Gylfi has scored a lot recently, overperforming his expected goals and covering up a lot of the offensive staleness. 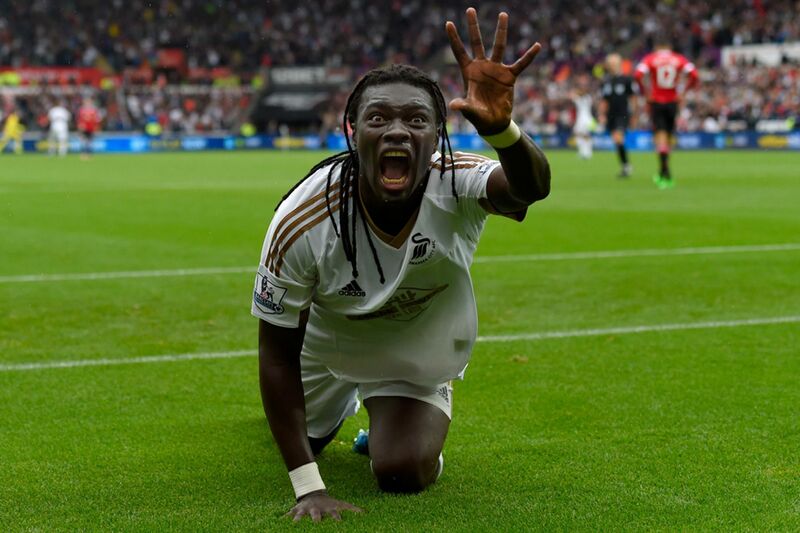 It’s difficult to say what Swansea need to do in the future. It would be useful to get a manager who can genuinely innovate. Swansea still play idiosyncratically for a team of their size, with an average possession per match of 52.1%, the 7th highest in the league. Bournemouth play similarly, have a far lower budget, and a team of players I think it’s pretty fair to say are objectively worse, yet have played better than Swansea this year – their expected goal difference is 11th best in the league. My own instinct would be that Swansea will do everything they can to get Brendan Rodgers back in the summer, an idea I can easily get on board with. Beyond that, as any midtable club, I would be thinking about spending big on managers. Relative to the cost of players, it is probably worth it; lest we forget that Rafa Benitez is at Newcastle on a wage reportedly just under £40k per week, much less than Andros Townsend, who also cost £12m for the right to pay in the first place. We stumble here onto an ongoing debate in analytics – do managers do anything? Soccernomics and The Numbers Game introduce the idea that wage spending correlates with performance so well that there is little room for manager effects. The problem with this is that wages and performance are like smiling and happiness: are you smiling because you are happy, or because you want to be happy? They aren’t quite the same thing. And the same things that wages could be a proxy for – mainly player quality – probably includes managers. If all the wage-performance correlation is showing us is that bigger clubs have better players that play and are paid better, the better managers will be there too. A problem Swansea have had recently is that as a club without a wealthy owner, one where the fans own 21.3% of the club and the majority of the board invested when it pretty much went bankrupt, it has been difficult to invest into the future. Where Bournemouth can say ‘hey, if we stay in this here thing, we’ll get an increase of £40m in the new TV deal, let’s spend now to try and do that’, Swansea can’t get a sweet interest free loan, while posting ‘annual profits in the last few years are among the lowest in the Premier League‘. The club is in an awkward transition phase where they had to sell Jonjo Shelvey, probably their most important player in the first few months of this season but one of questionable consistency, to a relegation rival to finance signing Alberto Paloschi for £8m. On top of that, the Supporters Trust that own just over a fifth of the club recently pointed out how difficult long-term financial planning can be given the demands of players joining relegation candidates. The club are looking for investment, and may be able to spend more in the summer now that they are safe and the new deal is coming in. Were I the club, I would appoint a ‘Director of Football’, hugely expand my scouting and recruitment network, and get a head coach in who is gonna work with that, though this may run into trouble with good ol’ Brendan. A clear mandate would be established on the sort of system that these players should be able to play in, a task that would be relatively easy with the established style at Swansea. Huw Jenkins, the club’s chairman, has done a brilliant job of recruiting up to this point, but the truth is there is serious room for more intelligent recruitment in the Premier League’s midtable. Wilfried Bony, an easy £12m buy after an obscene season with Vitesse, was flipped for £25-28m, and big clubs have an unusual necessity for ‘Premier League experience’. There is a market in being that stepping stone, one Portuguese clubs thrive on being between South Americans and Europe. Oh, and I’d hire some analytics folk.